The Rocket Feeder only entered the fishing world a couple of seasons ago and it certainly made an impact. It works around the same principle as a spod whereby loosefeed is cast out within a rocket-shaped device to feed a swim accurately at range, but here there’s a baited hook attached. The Rocket Feeder itself is a small conical plastic device that is a cross between a feeder and a large float. It has fins for stability during casting, holes to let the feed escape and a bright orange sight tip containing foam for added buoyancy. Under the feeder there is a link and a swivel to join it to the mainline. 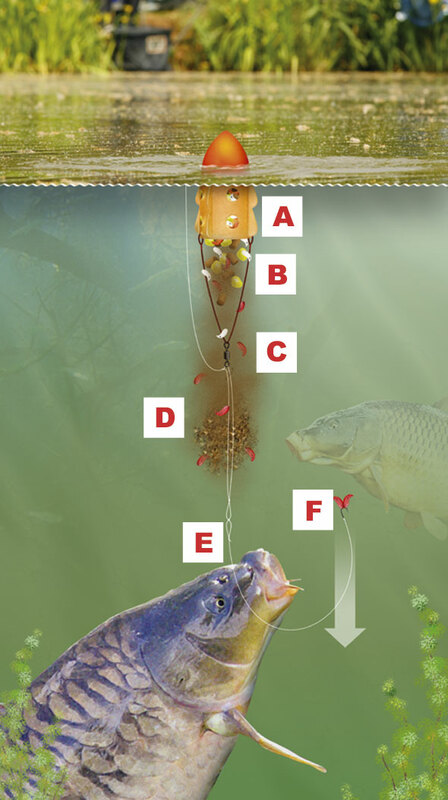 The principle behind this is to be able to fill the Rocket Feeder quickly and cast it out to create a cloud of slow-sinking loosefeed that the carp will intercept to take on the drop. Then your bait is presented on a fairly short, unweighted hooklength to catch the fish high in the water. In order to ensure that the bait remains inside the Rocket Feeder on the cast, a small layer of soft groundbait can be used as a plug – this also helps cloud the water upon impact too, helping to draw even more carp into your swim. A The Rocket Feeder is a highly buoyant cross between a float and a feeder. B Fill the feeder with small slow-sinking baits like casters, maggots and pellets. C It’s best to attact your Rocket Feeder onto the line using a long loop. D The groundbait plug will create a highly-scented cloud in the water that attracts even more fish to your swim. E Make sure your link between mainline and hooklength is a strong one as bites can be really savage. F Use small baits on the hook to ensure that they sink slowly, therefore giving the carp plenty of time to see and take them as they fall.